Moses Shumow, Marcela Moyano, Salma Abdelrahman, Eric Thompson and Regina Davis at the “Storytelling to Change the World” conference. But a simple search on Google News reveals a starkly different narrative about Liberty Square, yielding stories of mass shootings, violence and a community in limbo as county plans to raze and redevelop Liberty Square loom nearer each day. “If it bleeds, it leads,” said Mallary Tenore, executive director of the nonprofit organization Images and Voices of Hope (ivoh), referring to a phrase commonly used in newsrooms to decide what makes the headlines, based on the idea that topics like war, violence, and poverty tend to draw a reader’s attention. 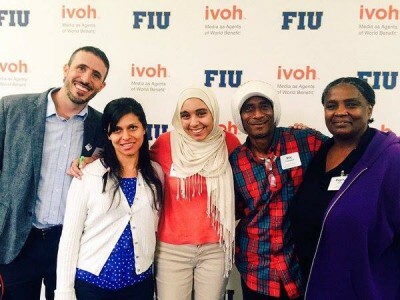 “But does it have to?” Tenore asked attendees of a conference hosted by ivoh and the FIU Office of Engagement last week that sparked a heated discussion between journalists and community members concerning the way the media portray marginalized communities. The “Storytelling to Change the World” conference spotlighted restorative narrative: stories that focus on community resilience, restoration and hope. Research shows that an onslaught of violence and despair in the news is associated with acute stress symptoms, triggers flashbacks and encourages fear mongering in viewers, and that the public is starting to gravitate toward more positive stories instead of the negative. Mariana Santos, the interactive and animation director at Fusion and FIU’s Knight Innovator in Residence, and John Yearwood, the World Editor of the Miami Herald, each spoke about how they’ve incorporated restorative narrative into their journalism. Santos, for example, was involved in a project on street harassment in Mexico City, and Yearwood focused his time coordinating stories of recovery after the 2010 earthquake in Haiti. Later, a group of FIU School of Journalism and Mass Communication graduates spoke about covering Liberty City in class, assignments which professors Moses Shumow and Neil Reisner use to break down stereotypes and teach them to cover without bias communities that aren’t their own. The students commented on the experience as outsiders entering a part of town many people consider a “crime-ridden Miami slum” and getting to know its people. Christopher Santiago said that before working on a documentary in Shumow’s class, which tells the story of Liberty Square from the eyes of its residents, he had never heard much about the area. And when he did some research, the news stories he found were discomforting. But what he saw when he arrived in Liberty Square changed his mind. “It’s what I call the ‘So Nice Phenomenon,’” Reisner said, referring to the “aha moment” he sees when his students, who produce a section of the South Florida Times called the Liberty City Link, meet Liberty City’s residents for the first time and realize the stigmas associated with the community are unfair. 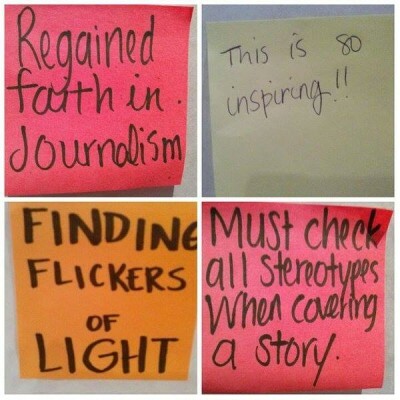 Conference attendees created an inspiration wall detailing their personal experiences and what they learned that day. Even community members weighed in on the discussion. “Our frustration is we don’t get no coverage on the good, no matter how hard we try,” Liberty Square community organizer Eric Thompson said. One resident, Alivida Phillips, spoke of how she came to live in Liberty Square. Phillips is a former resident of another housing development in Liberty City that was demolished nearly 13 years ago and its residents forced out in a raze-and-redevelopment plan similar to what is proposed for Liberty Square. “Make sure that Liberty Square residents do not get swept under the rugs like Scott projects got swept under the rug,” Phillips pleaded with the journalists present, voicing her dissatisfaction with the way the media covered the Scott Carver Projects incident and her fear that what happened to her then will be repeated in Liberty Square. WLRN radio reporter Nadege Green, who grew up in Liberty City, said journalists can’t only show up when someone dies. The best way for a journalist to gain a community’s trust is to get out of city hall and talk to the people who are affected by policy-making. Overall, attendees learned that the way media portrays marginalized communities shapes the way the public views these communities, and that a deeper interaction between journalists and those they cover creates a more holistic, less biased story. “Storytelling to Change the World” was hosted by Images & Voices of Hope, FIU’s Office of Engagement, Office of Global Learning, School of Journalism and Mass Communication and the College of Architecture + The Arts, with support from the Knight Foundation, The Education Effect, BMe Community and Related Urban.